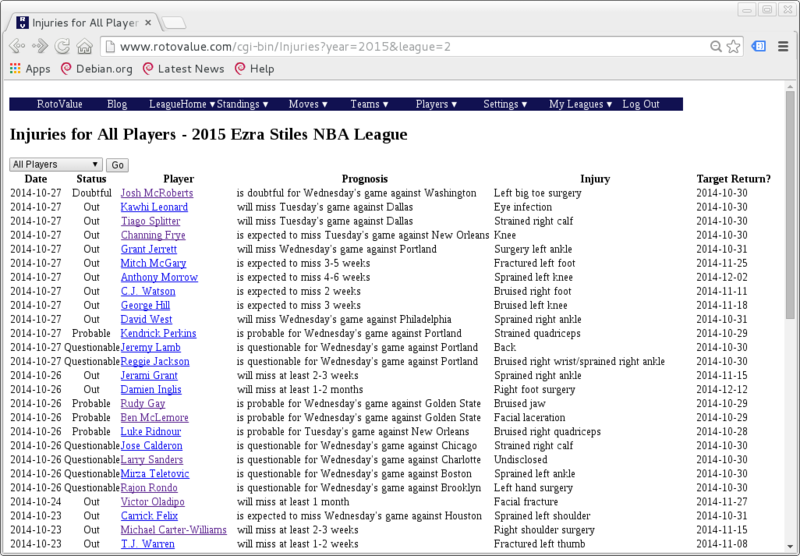 I’ve just rolled out some enhancements to RotoValue’s handling of injury reports. The target return is an estimate of when the player might return, usually based on the prognosis. If it’s a range, then I’ll estimate the middle of the range, so since Anthony Morrow is expected to miss 3-5 weeks, I’m estimating 4 from the injury date of October 27th, giving him a target return of December 2. When a player is expected to miss a given game, I’ll set the target return to 2 days after the game, on the theory that if it’s known he’s going to be out, the injury might keep him out a little longer. If he’s listed as questionable or doubtful, then I use 1 day after the game, while if he’s expected to return or is probable, then I’ll just use the date of the game. Kevin Durant is recovering from foot surgery, and isn’t expected back until mid-December. So the projected stats shown in the search are scaled back to reflect that missed time, helping you better value Durant (assuming, of course, he returns on schedule!). And if I moved past his target return, Durant would project to be the most valuable fantasy player in this format. I also use the Search tool for my team when considering my weekly lineup, this time only showing stats for the upcoming week. And here I’ll appreciate having stats prorated to the target return date, especially for players who might miss a game or two. In my experience, often a player who is questionable for an early-week game winds up missing multiple games that week, which can be devastating for a fantasy team. Hence I’m being cautious about their return: if they’re questionable or worse, I’ll assume they’ll miss at least that first game, and if they’re already ruled out, I assume they’ll be out at least 2 more days. When you’re compiling cumulative stats, a four game week from a reserve may well indeed be more valuable than a 2-3 game week from a star (or perhaps even fewer games should he be out longer). The site already prorated stats based on the schedule itself, but now it takes into account reported injury status as well, leading to better estimates. 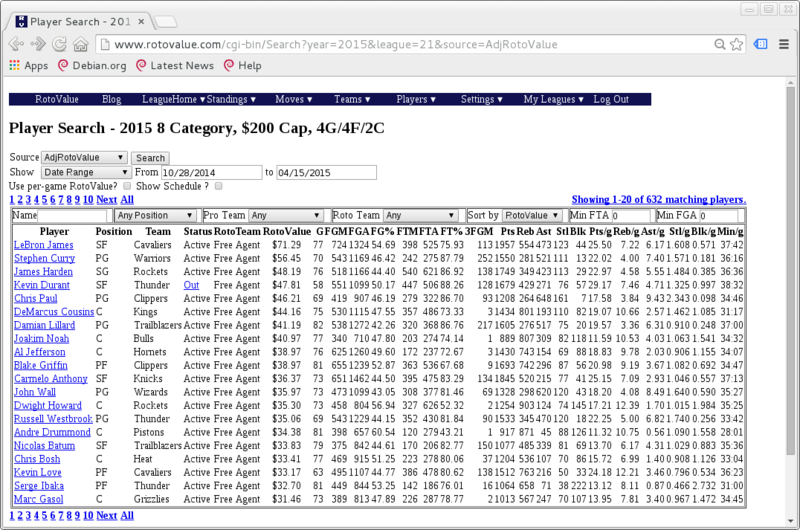 Deciding whom to start in a given week is often important for fantasy success, and by adding Target Return into its future stats display, RotoValue now gives you better information to make those decisions. 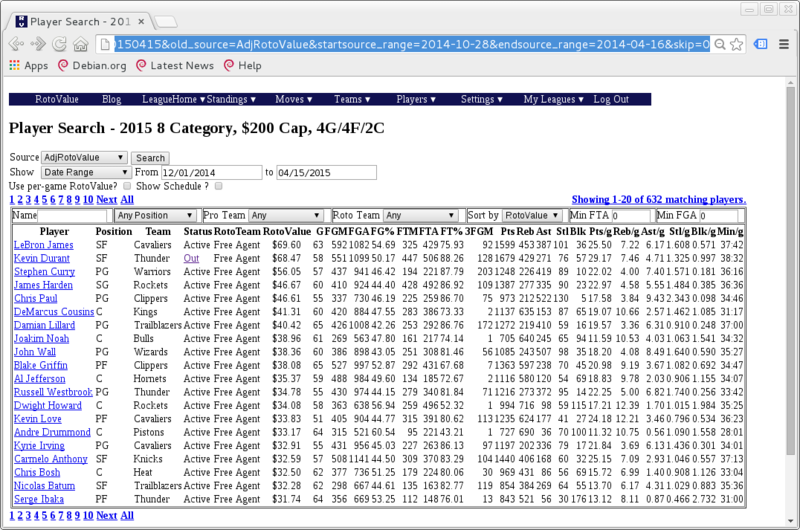 This entry was posted in NBA Basketball, Projections, RotoValue. Bookmark the permalink.